Degenerative disorders are conditions that worsen over time. Some can be improved, or at least slowed, if caught early on. 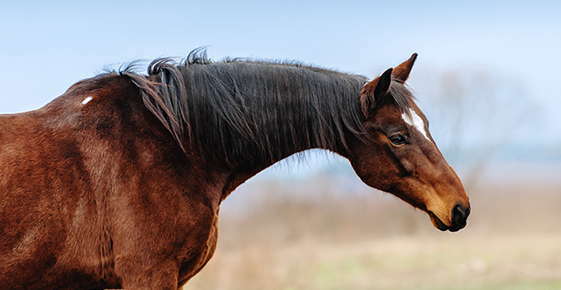 Here are a few common degenerative conditions that horses may face. Wobbler syndrome can be divided into two categories, static or dynamic stenosis. Static means the horse has a stiff neck all the time; dynamic means the cervical vertebrae are only affected when the horse extends or bends its neck. The earlier you identify wobbler syndrome, the better the prognosis. Your equine veterinarian will do a neurologic exam to locate the source of the problem, determining whether it’s in the brain or spinal cord. X-rays and a contrast study done under general anesthesia may be required. The contrast study involves injecting a special solution near the horse’s spinal cord. Then, significant narrowing of the spinal canal will show up on X-rays. In the past, equine veterinarians usually recommended that horses with wobbler syndrome be euthanized. Now, many equine vets are experimenting with different treatments, including stall rest, surgery and vitamin E supplementation. As horses age, the likelihood that they’ll develop heart troubles increases. Degenerative valve disease (DVD) is one of the most common types of heart disease in geriatric horses past the age of 20. Horses with DVD start out with normal hearts. However, over the years, they develop a faulty valve that leaks blood backwards. This causes a heart murmur. An equine veterinarian often notices the murmur before the horse’s performance decreases. In early stages, the valve may not cause problems. The more active the horse is, the more likely you are to notice a decline in the horse’s performance. As the condition progresses, riders should exercise the horse more gently, for the sake of both horse and rider — you don’t want your horse to have a heart attack while galloping with you on its back. Heart medication for horses with DVD is very expensive. If your horse is your beloved pet, once the heart murmur gets serious, it may be time to let your horse retire and peacefully live out its days at pasture. Degenerative joint disease (DJD) has a long history. Paleontologists have collected evidence of this disorder in fossil reptiles. Just like those lizards of yore, horses and humans commonly suffer from this painful condition. Also called osteoarthritis, DJD is a leading cause of lameness in sport horses. DJD happens when cartilage around your horse’s joints is destroyed. This may develop after a traumatic injury, fracture or the formation of cysts under your horse’s cartilage, or spring from infective arthritis. The lower leg joints are most commonly affected. Growth of extra bone often accompanies the cartilage damage, adding to your horse’s stiffness and joint swelling. Range of motion decreases. Your equine veterinarian may suggest treating your horse with NSAIDs; although chronic use of these anti-inflammatory drugs can cause other problems, such as ulcers and internal hemorrhaging. Some horses benefit from physical therapy or surgery. All degenerative conditions respond best to the care of knowledgeable, experienced equine professionals. Call our office today if you’re worried your horse may be suffering from a degenerative condition.